﻿ ROXP7J - Order Up! synopsis (EN) Order Up is a delicious blend of precision cuisine crafting and culinary empire building, all rolled into a light and flaky crust of memorable characters and humorous situations. 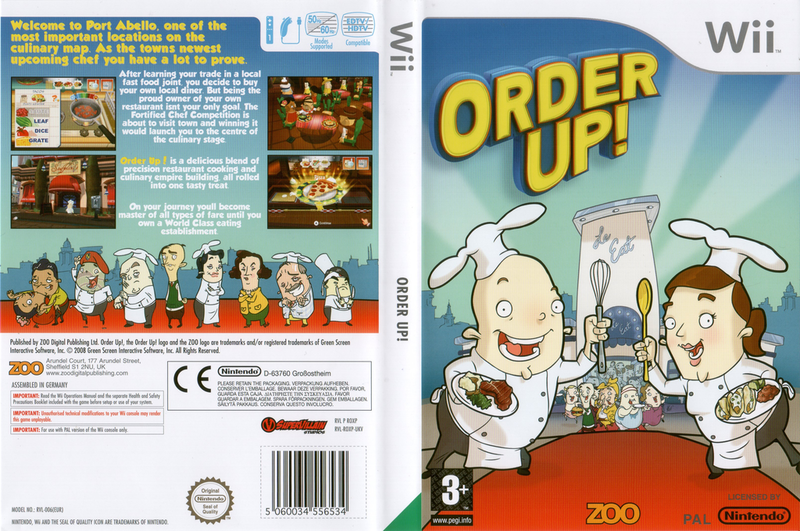 With the Wii Remote in hand, the player will be guided from burger to chateaubriand; taught every aspect of food preparation and presentation. 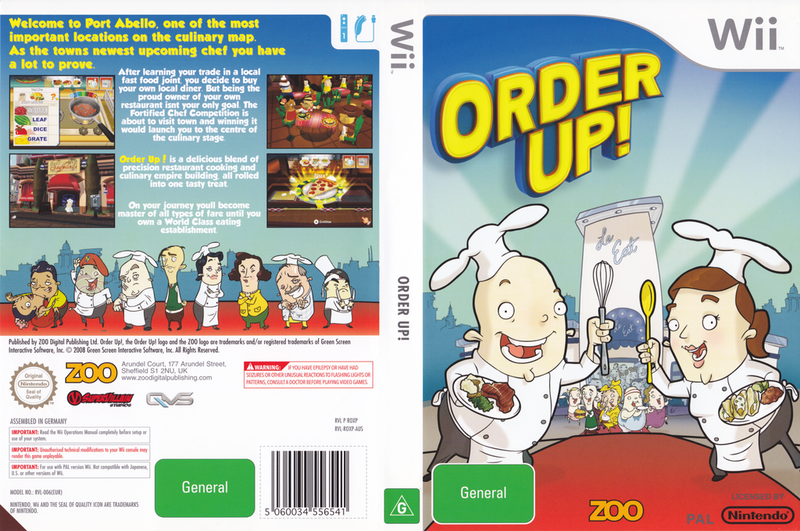 For anyone who has dreamed of becoming a world-class chef or restaurant mogul or both!, Order Up will deliver. The core game play of Order Up is cooking, from preparation to presentation. Preparation consists of "cutting and cooking" while Presentation refers to garnishes and "flourishes" - e.g. sauce drizzled over a dish to please the eye or the use of flame (flambé) for dramatic effect. Beyond the core, game play includes rising through the ranks of the culinary world from fast-food to world-class restaurants as chef and owner while ever-expanding your cookbook of recipes and ever-improving the quality of your equipment. Along the way you will face demanding patrons, discriminating food critics…and at the pinnacle of your fame in the world of fine cuisine you will be invited to complete in the, "Fortified Chef World Challenge" - an Iron Chef-style cooking competition. synopsis (FR) Order up! place le joueur dans la cuisine d'un restaurant sur Wii. Il doit s'occuper de la vaisselle et de la cuisson, diriger les cuisiniers assistants, faire face aux demandes du patron et aux critiques culinaires. Au sommet de la gloire, il s'agit de gérer de multiples restaurants et de créer de nouveaux plats. synopsis (ES) Order Up! es una deliciosa mezcla de cocina a ritmo frenético y construcción de un imperio gastronómico. Corta, troza, rebana y amasa tu camino al estrellato culinario. En el camino deberás enfrentar jefes quisquillosos, críticos exquisitos, un malhumorado inspector de salubridad, y mucho más.